Starting next August, England’s Gatwick will wedge 270 cars into a lot that previously held just 170. Instead of people doing the parking, valet robots will take over. You just drop off your car and let a droid-like device fit the car into a rather small space. Since you would have driven your car into an airport parking space, the Gatwick experiment appears not to be eliminating jobs. Elsewhere though, technology will replace people. The word to remember is disruption. 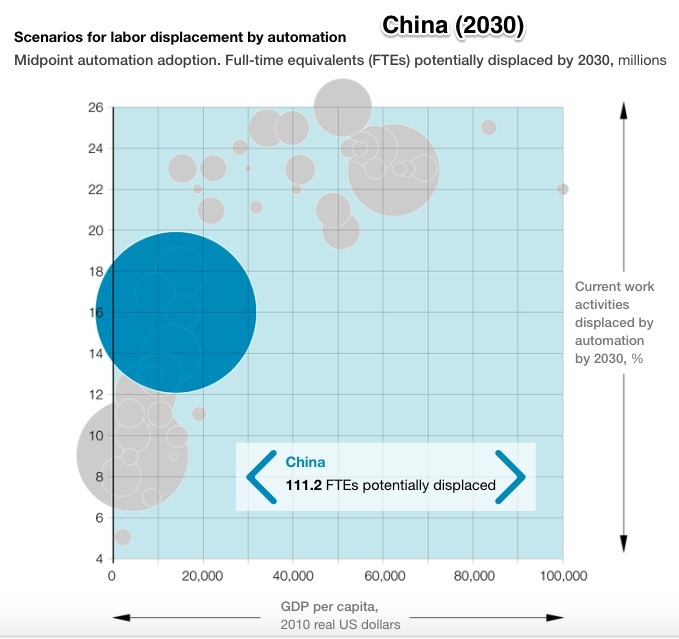 Artificial intelligence (AI), computerization, and mobile robotics could take over large parts of the workplace. To make it more real, think the driverless car or automated ticketing at airports and movie theaters. 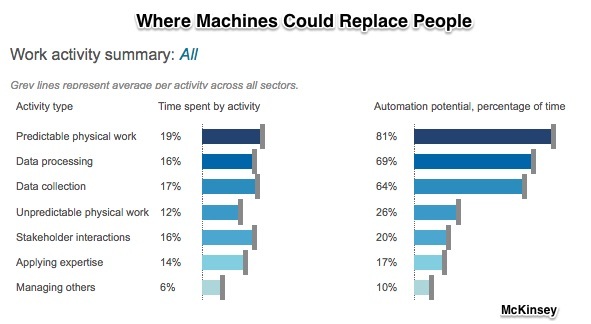 However, as the consultancy firm McKinsey suggests, rather than occupations, we could be talking about activities. But the results are similar. 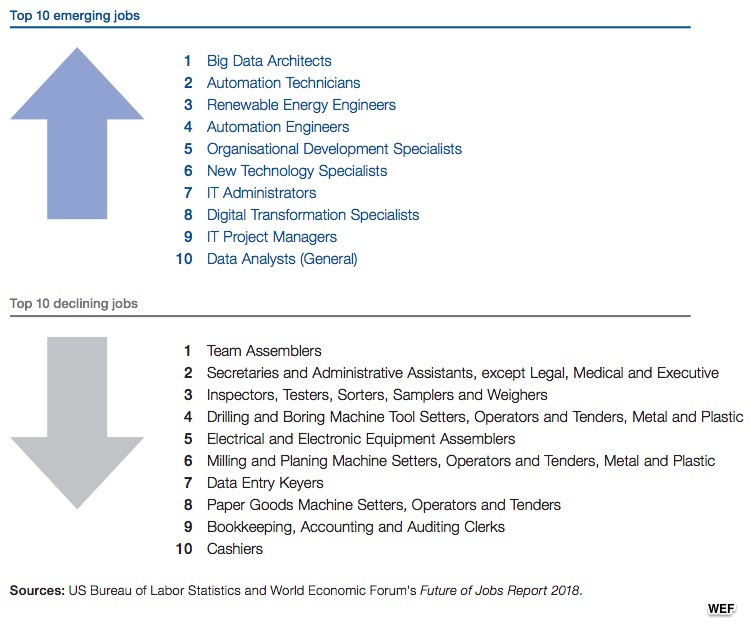 Jobs need to be redefined. And the people who do them will need new skills. 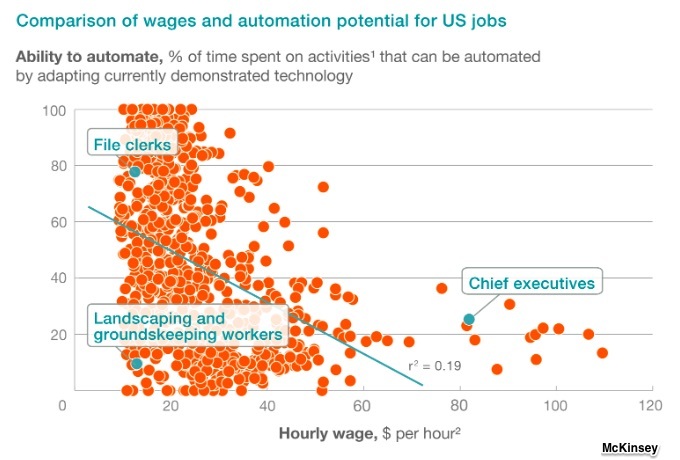 As for the jobs, we can project that whatever is routine could be automated. Meanwhile positions requiring more creative and social intelligence at the top tiers and care taking at bottom of the jobs ladder could remain. 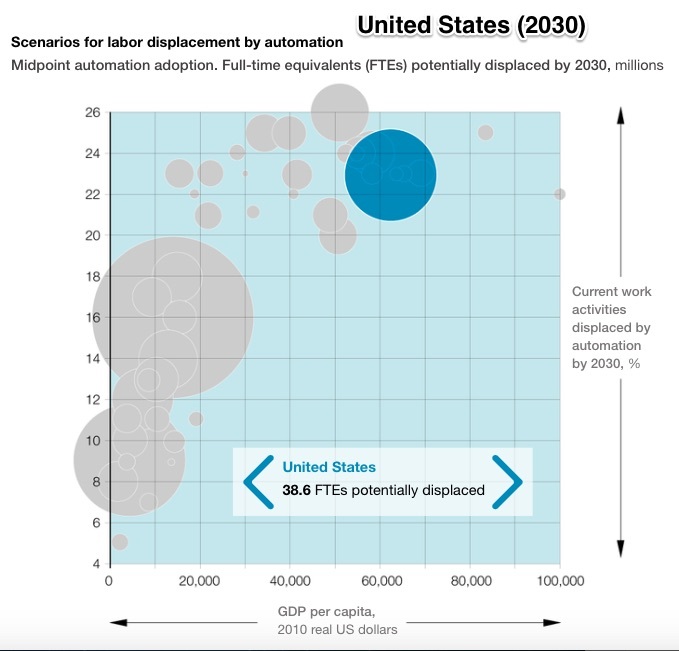 According to a Brookings Report, the U.S. heartland will probably be hardest hit by automation. In places like Miami County, Ohio, 35% of all jobs could be threatened or, in Chattooga County, Georgia, we are looking at 39%. The five states with the highest risk are Indiana, Kentucky, South Dakota, Arkansas, and Iowa. Queen Elizabeth could have been referring to what economist Joseph Schumpeter (1883-1950) called creative destruction. The process on which economic growth depends, creative destruction is spawned by the entrepreneurs who develop the innovative business ideas that disrupt the current economic order. 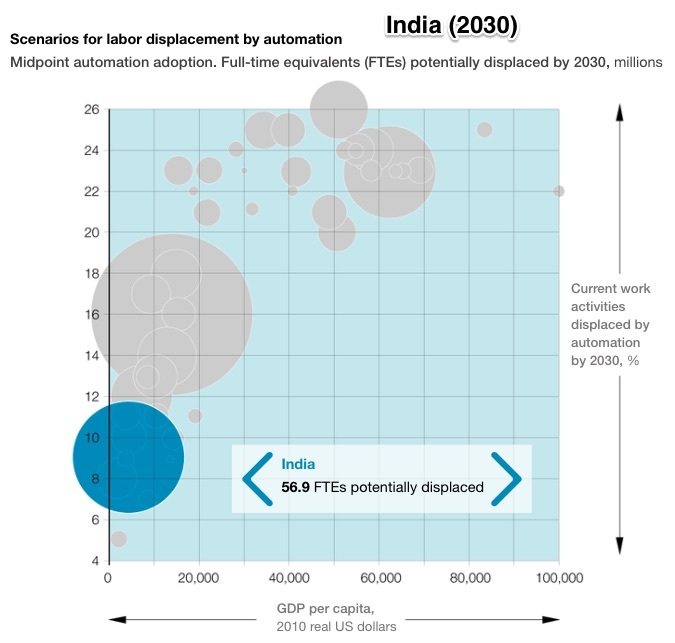 Fueling creative destruction, automation is making some jobs obsolete. My sources and more: Axios had an overview of automation links that linked to a new Brookings report. 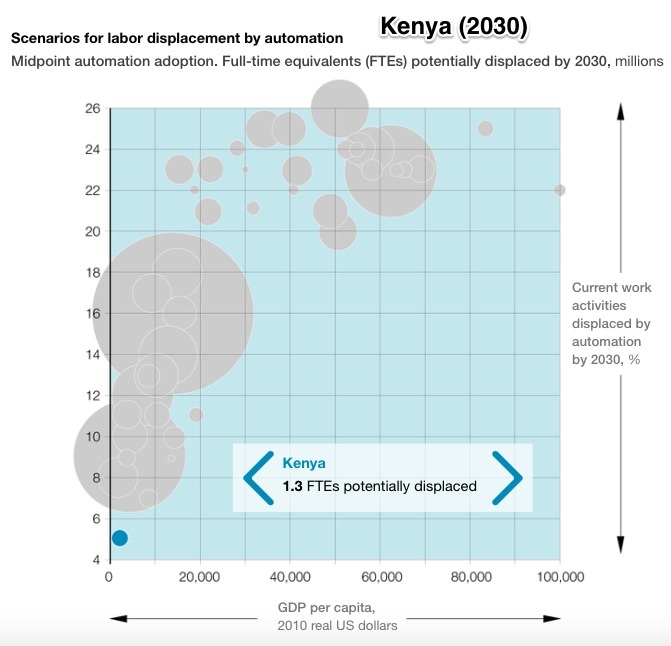 From there, McKinsey, here and here told more of the story while the World Economic Forum (WEF) took the next step with its “re-skilling” focus. I also recommend the BBC’s Gatwick story and some history from this paper.